From the outside, Nawara Omary Elliott’s home in Vienna, Virginia, looks like any other. 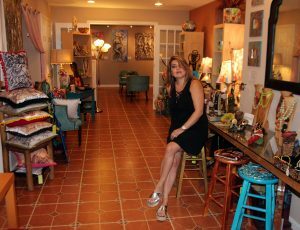 But step inside her basement, and it’s a treasure trove of intricate paintings, jewelry, sculptures and other art. The focus of her gallery, Dara Global Arts, is on women – either the artists themselves or the subject matter. The works are mostly done by immigrants from Iraq, Syria and other countries experiencing violent strife, along with constraints on their once vibrant societies. 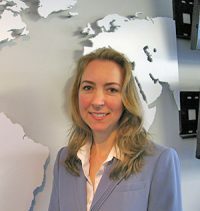 Elliott came to the United States from Iraq in 1986 at age 18 to study electrical engineering, and to enter a marriage arranged by her parents, which has since dissolved. The idea for the gallery came about when Elliott, who is now remarried, was a single mother. She wanted to share her heritage with her children. “I feel more than ever we need a place where we can show who we are from that part of the world,” she said. And when members of the general public visit the gallery, she hopes they take away a greater understanding of the region’s vibrant art – the mosaics and heartfelt paintings of those who lived through conflict. 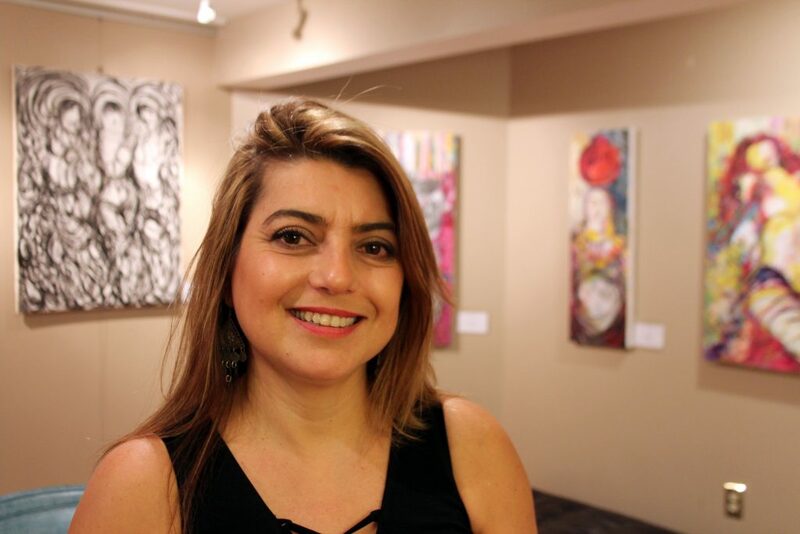 Uruba “Ruby” Rawi, who came to the United States with her family in 2013 at age 50, is one of the featured painters who sought a platform for her work. She found Dara Global Arts through an Internet search and thought the name “Dara” sounded Iraqi. It turns out she and Elliott attended the same high school during different years in Baghdad. Their shared roots helped Rawi feel more at home. “When you’re a newcomer, you need to gather with people who at least know your background, you feel more comfort until you adjust,” she said. 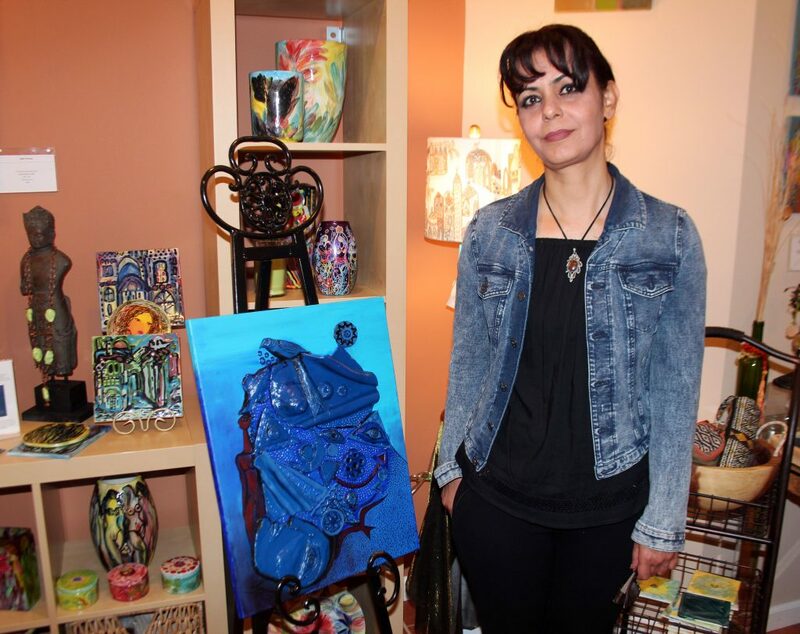 “In my grandfather’s house, where I lived and grew up, everything was colorful.” Rawi saw beautiful colors everywhere – in the elements during her studies in chemistry and in the rich tones at her aunt’s gallery in Iraq. But when the war came, “everything started to change. The colors started to fade out and violence darkened our lives.” She switched to humanitarian work to try to help those around her, before coming to the United States when the violence became too much. “We miss the peace and coexistence (in Iraq), and above all the safety,” Rawi said. Once in the U.S., she wanted to celebrate the colors she remembered. 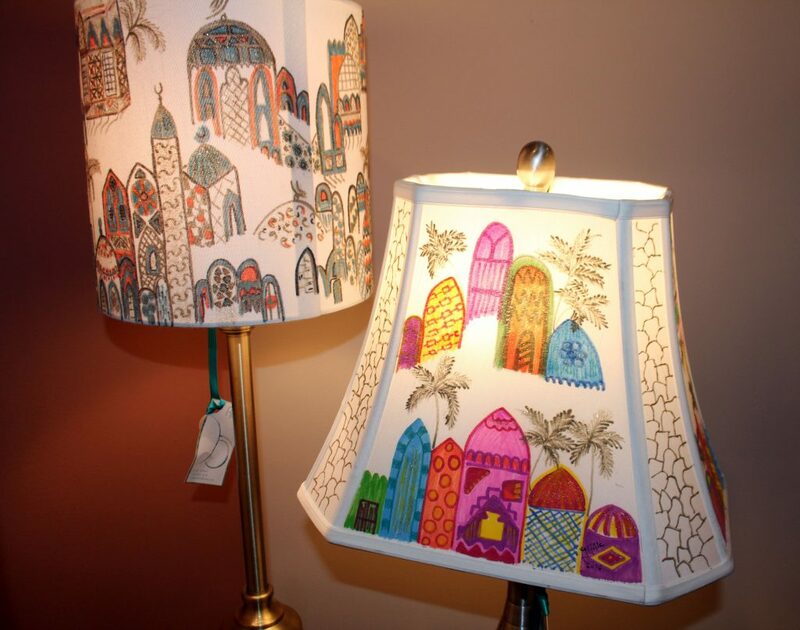 She chose to paint lampshades in jewel tones because she didn’t see anyone else doing it. At her exhibition opening, she wore a turquoise dress, instead of the preferred black outfits of her culture. “She kept telling me, ‘I’m not an artist, it’s just a hobby,’” said Elliott, but Rawi’s show in March drew so many people, they were crunched shoulder-to-shoulder in her basement. At the shows, Elliott invites experts to speak on issues related to the art. For example, at an exhibit of a Bolivian painter, who depicted sexual abuse on college campuses, she invited the director of a local women’s center and a psychologist who works with immigrants from places such as Afghanistan and Iraq. 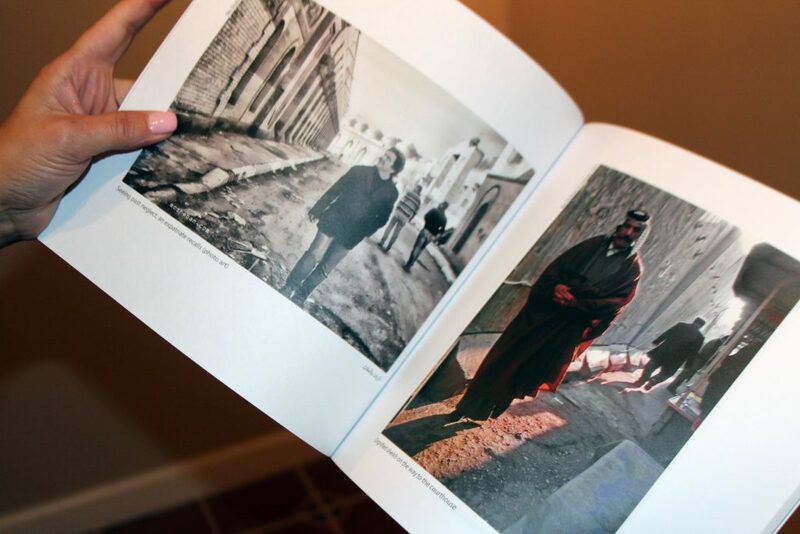 The next featured artist is Maysoon Z Al Gburi, who came from Iraq in 2013 as a refugee. The former journalist was moved by the stories of the women she met, including the plight of Yazidi women kidnapped by Islamic State fighters, and a woman who was forced to marry a man in order to pay off the ransom of a family member. She began painting women without hands to represent their physical and emotional abuse, and the effects that might linger through life. “Even the stereotype of women in that part of the world is physical and not what she can actually bring to the table,” Al Gburi said through a translator.